A leading public school has revealed it is interested in running a new academy school for state sector pupils. Oundle School, in Northamptonshire, said it would like to set up an institution specialising in science and technology. 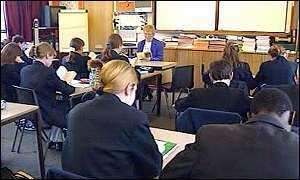 The proposal follows an government invitation to independent schools to take over the running of academies, often based in areas of severe educational need. Oundle's headmaster, Ralph Townsend, said: "I would certainly be interested in the idea of Oundle opening up a specialist state school available to those not in a position to pay school fees. "This could follow Oundle's distinctive tradition in science and technology. "Success comes from high expectations and expectations rely on a positive ethos in a school, backed up by the family. "Ambition can be sparked by an encounter with a single gifted teacher but the real challenge is to alter the expectations of the whole community." Under the government scheme, a private school provides 20% of the start-up costs of an academy, up to a maximum of £2m, with the state paying the rest. The school then runs the academy, which is funded by the taxpayer. The academy is not able to charge the state pupils any fees and must choose its intake from across the community. Earlier this week, schools minister David Miliband revealed that 70 to 80 public schools he had written to on the subject of them running academies had given an encouraging "response" . Oundle is the first openly to endorse the idea. Last October, Mr Miliband asked private schools to become sponsors, saying the idea of an "Eton academy" sounded good. Last year, 50.4% of A-level results were at grade A, with a pass rate of 99.5%. Dr Townsend said: "We already have links with schools abroad with the purpose of sharing teaching ideas and best practice. "We shall be delighted to share ideas with state schools and I am sure that any links that we might form will be beneficial to all concerned."